The University of Alabama at Birmingham's presence in the region is a key reason why bioscience is on the rise in Birmingham. By the numbers, Alabama’s biosciences industry is booming. A recent study from the University of Alabama said the industry contributes $7.3 billion annually to Alabama’s economy through the work of 780 companies. The industry employs 48,000 directly and indirectly, and of the 17,871 employed directly by biosciences, average annual salary is $67,664. Specifically in Birmingham, bioscience is on the rise, home to UAB, Southern Research and a number of biotechnology companies like Evonik Industries, which in March announced plans for an expansion of production and a Global Competence Center for Medical Devices at its local facility. Much of this is due to the presence of the University of Alabama at Birmingham (UAB) in the region, said Dr. Kathy Nugent, executive director of UAB’s Bill L. Harbert Institution for Innovation and Entrepreneurship and assistant professor for UAB’s biotechnology master’s program. Evonik Industries expanded its footprint in Birmingham this March. Bob Shufflebarger is the CEO of TriAltus Bioscience, a Birmingham-based company that provides services for life scientists who work with genetically engineered proteins. He said as Birmingham biotech companies have significant successes, it builds momentum and investor confidence so that other burgeoning biotech companies can access capital. According to a report by the Biotechnology Innovation Organization, since 2012 Alabama bioscience companies have received $101 million in venture capital funding, with investments focused in biotechnology and health information technology. “I’ve been in the life sciences community as long as I’ve been in Birmingham, and because of inventions coming from UAB, I see [the biotech emergence] as a part of a larger movement as Birmingham’s environment becomes more attractive for startups,” he said. UAB’s Commercialization Accelerator, Innovation Depot and Alabama Launchpad are a few of the many organizations that have made Birmingham a hub for startups. This growth is intentional, Nugent said, and not just from UAB – the Birmingham Business Alliance, Alabama Power and the City of Birmingham are all strategic partners in recruiting bioscience companies to Birmingham. Southern Research is a multifaceted research institution located in the heart of downtown Birmingham. Advanced Tear Diagnostics: This company develops and markets a highly specialized lab testing system to help optometrists and ophthalmologists detect biomarkers associated with the diagnosis and treatment of a variety of external ocular disorders. Headquartered in Birmingham, the company is the first to receive FDA approval for the diagnostic testing of tears. BioDtech: BioDtech accelerates the development of technologically advanced products geared toward the endotoxin market. Endotoxins are toxins that are present inside a bacterial cell and are released when the cell disintegrates; they are sometimes responsible for characteristic symptoms of a disease. Blondin Bioscience: The company, which does molecular testing for cancer, announced last year it was a collaborator on a prestigious grant awarded by the Academy of Finland that will aid in the study of breast cancer therapies. Circulogene: This blood-based cancer screening company had a recent win when UAB researchers successfully used its molecular testing to identify multiple mutations in advanced ovarian cancer patients following chemotherapy and surgery. The trial’s results, according to Circulogene, could lead to better and more targeted treatments in late-stage ovarian cancer and other hard-to-treat cancers. Endomimetics: This company developed a coating, BioNanomatrix, that coats devices commonly used to help doctors treat patients, like stents. This coating mimics human tissue, minimizing the need for additional surgeries after the original procedure, improving the longevity of the device and reducing complications associated with having foreign items implanted in the body. 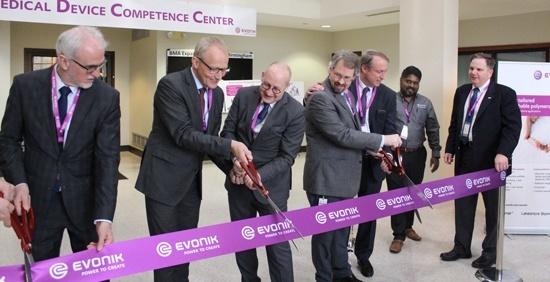 Evonik Industries: An international chemical and life sciences company based in Germany now calls Birmingham the home of its Global Competence Center for Medical Devices. Construction is also underway on a new RESOMER-brand polymers production facility adjacent to its existing Birmingham campus. Incysus: A producer of novel anti-cancer therapies, Incysus announced earlier this year a partnership with UAB professor Dr. Lawrence Lamb, who together will work to treat leukemia and brain cancer. Oxford Pharmaceuticals: This British born and now Birmingham-based company manufactures and distributes generic pharmaceutical products. Southern Research: Birmingham is home to this multifaceted research institution, and it is ever-growing. It works across four divisions – drug discovery, drug development, engineering, and energy and environment – and it recently added a new center dedicated to STEM (science, technology, engineering and mathematics) education and outreach. TriAltus Bioscience: The company offers scientific support services for biotechnology and pharmaceuticals and recently licensed a novel protein platform from UAB, which it plans to commercialize. The company has secured customers in the United States and three overseas companies since its launch. XpertDox: This innovative human clinical trial enrollment support services company raised $1 million locally in a seed round earlier this year, and just this summer partnered with UAB to launch XpertTrial, a search engine that matches patients to a list of active trials at UAB Medicine.